From 1979: the first (of, surprisingly, only two) paperback based on the TV incarnation of BUCK ROGERS IN THE 25th CENTURY. It's an adaptation of the show's feature-length pilot... which also doubles (with a few - ahem - tweaks as the feature film). As is often the case, it's based on an earlier draft of the script (and there's probably some author-embellishments as well) so doesn't match either of the screen versions. It's interesting that Larson doesn't seem to have been able to blag himself a co-author credit on this one... a business deal he managed to make with Universal's marketing department for both BATTLESTAR and KNIGHT RIDER book series. Apologies for the whopping great price sticker. It wasn't going to shift without damaging the cover so I decided to leave it in place. What's interesting about the 2 Buck Rogers books (I have them both on my shelf) is that the second was based on an unproduced script, so it's actually a new story - a novel idea for the 80s novelizations. 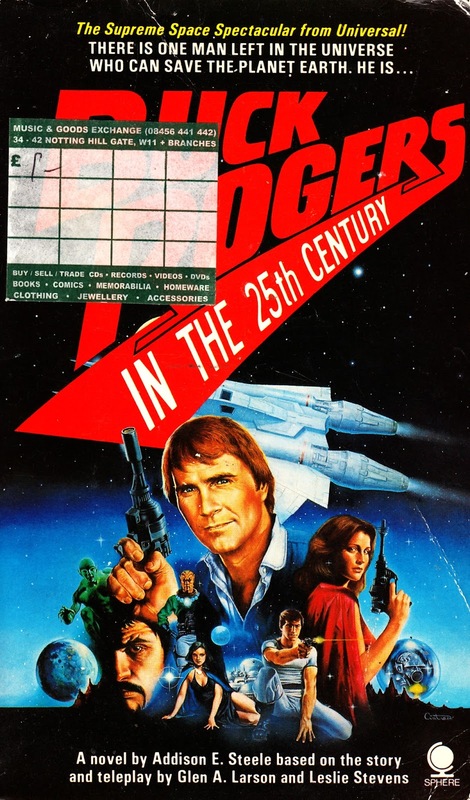 I always assumed THAT MAN ON BETA (my copy is buried deep in storage) was commissioned and published on the basis that it WOULD have been one of the early episodes to air... possibly during the period where NBC and Universal were planning a series (possibly ten) of occasional TV movies rather than a weekly series. At some point, before or after the book was published, the studio must have made the decision to dump it. I doubt it was ever planned as a "lost story" type release. 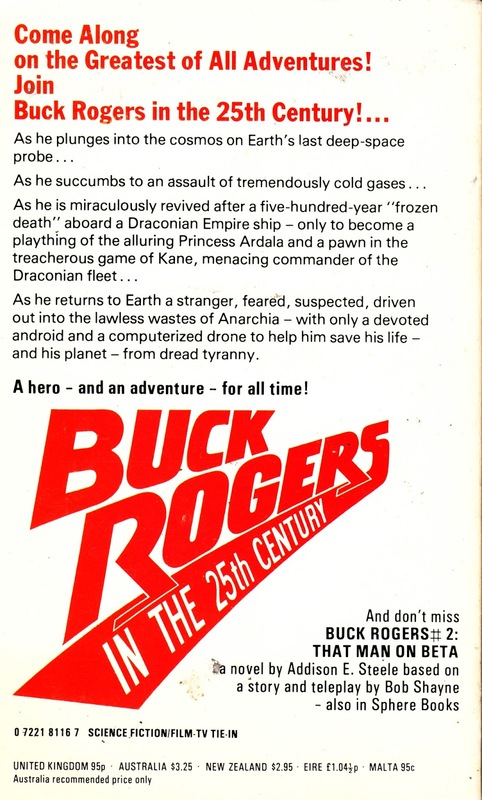 Also of note is that both Buck Rogers TV books were written by Richard Lupoff (writing as "Addison E Steele"), a well-known expert in the sci-fi pulps field and a fine and surprising writer in his own right.